Lisle Jane Pugh is the owner of Lisle’s Driving School. The school is based in Romford and she is one of town’s best female driving instructors. She has been an ADI for a number of years and understands the local area better than most. The company website has a lot of tips on how to choose a good driving instructor. Lisle has decided to provide this information free of charge and it’s definitely worth reading before booking. The tips include things such as questions to ask and red flags to look out for during your first lesson with a new instructor. Things such as were they on time? Were they completely focused during the lesson and did they debrief at the end, were all mentioned as important things to think about. Providing good advice is a sign of a driving school that cares about their students. Her prices are slightly above average for the Romford area. It costs £25 for a single hour, £37.50p for 1.5 hours and £50 for two hours. If you have a short notice driving test coming up, you can book the school’s late test rescue package. The package consists of 6 hours training and costs £240, working out at £40 per hour. 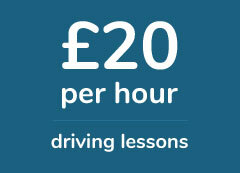 It’s not the cheapest driving course in Romford, but if you have a test approaching it could prove value for money. There are also gift vouchers available between 2 and 20 hours. Driving lesson vouchers make great gifts, so do mention if this is something you are interested in. Lisle’s Driving School have a number of positive reviews. On Facebook the school has a 4.9 out of 5 rating, based on 14 reviews. On Yell.com the school has 4.8 out of 5 rating, based on 4 reviews. Reading through the reviews, her ex-students find her friendly, professional and good natured. The vast majority of her students are female, as many prefer to learn with a female driving instructor. Lisle has to be one of the best driving instructors in Romford. She is so patient and friendly, I was really nervous but she helped me conquer my nerves and pass my test. Took me 42 lessons to pass and I needed every one of them. I'm a slow learner and Lisle took it really gently. She got me used to the controls and the back roads first. After that we went into town and my confidence went up! I enjoyed my lessons, she knows Romford well and I'm delighted I booked with her. Booked an intensive driving course as I work in Romford. Had 4 fast pass Sunday lessons with the school and overall I'm satisfied with the teaching. Would recommend if asked. Lisle is a great teacher. She's kind, patient and really funny too. She makes you feel really relaxed when you drive and she always focuses on areas where you are weak, not just working on the same things you've already done. Without her I'm not sure I would have passes, so I'm really grateful.